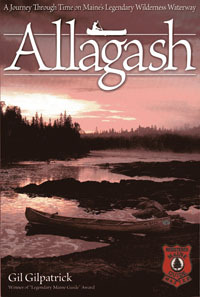 In Part One you are guided through the present-day Allagash region by Gilpatrick who has been a Master Maine Guide for over 40 years and has guided more than 100 trips through the Waterway. Significant historic and natural sights are highlighted and these points of interest are punctuated with anecdotes of personal experiences.. In Part Two you will learn about Maine's colorful lumbering industry going back to the middle of the 1800's. You will be impressed at what a sophisticated, well engineered operation it was back then. Like the western cowboy, the lumberjack's life has always seemed rugged and adventurous - it was romanticized. The fact is, the lumberman's life was filled with hard labor and countless life-and-death situations from sunup to sundown. 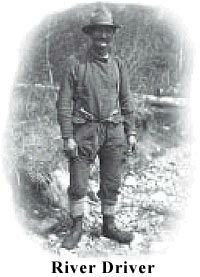 You will be introduced to lumberjack characters like Mushrat Murphy, and be taken to lumber camps and onto the river to experience the life of the river driver. Part Three is about the Bear Clan of the Wabnaki. The Native American's use of the Allagash has been traced back to the end of the last ice-age. The account of their life along the river is sprinkled with colorful lore and legend. 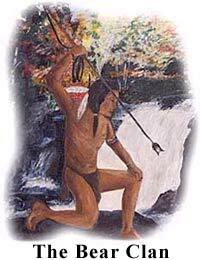 You will be introduced to the Great Spirit, or Manitou and to Gluscabe, a tribal hero. 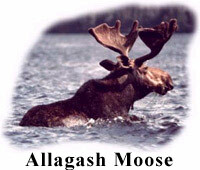 The beautiful Allagash was not untrodden wilderness. "It was a region that gave life to a people who husbanded its resources for thousands of years."